Well, it goes back many, many moons ago, in the late 60's. I got my Honda Mini Trail 49cc around 1970. I am from Southern Africa (Wild Coast) and fell in love with the Honda CB 750 sohc. I admired a Legend Disc Jockey from L.M. Radio, who drove past our house once a month, all the way from Lorenzo Marques, (now called Maputo) in Mozambique. 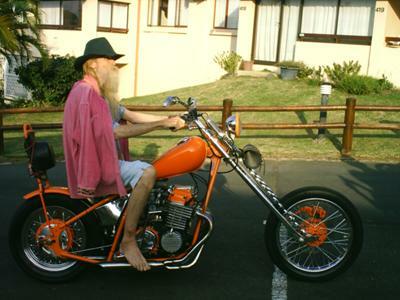 Darryl Jooste was his name, and he looked like a Viking, red beard and a big man in statue and character. I was bout 15 or so. He simply waved at me, opened up that throttle, spinning crazy, as we only had dirt roads, not tarred. All the kids was scared of me cause he only waved at me. He had Apes as handlebars and to me that was a "Chopper". I listened in secret to LM. Radio, only on short wave it was received, every Friday night, he did the top 20 music show. My father prohibited us from listening to Rock music. Darryl passed away in bout 1979/80. I was sad cause by then our roads crossed and it was due to heart failure. I once took him to hospital, but that is another story. From thereon my life took many turns, but never was I without a bike to this day! I attach a photo of my Chopper, called "Janis Joplin", with the second project fast on its way to completion. You need to build some forward controls.